Tennessee Legislature Passes Broadband Accessibility Act, Delivers Hollow "Victory"
MINNEAPOLIS, MN - Late yesterday, the Tennessee Legislature officially sent Governor Bill Haslam's signature legislation, the Broadband Accessibility Act of 2017, to his desk. Unfortunately, this bill is more about making taxpayer dollars accessible to AT&T than ensuring rural regions get modern Internet access. "What we have on one side is a taxpayer-funded subsidy program, and on the other we have a subscriber-based model," says Christopher Mitchell, director of the Community Broadband Networks initiative at the Institute for Local Self-Reliance. "The tragic thing is, AT&T is a taxpayer subsidized monopoly in rural Tennessee that only has to provide a service far slower than the definition of broadband. Locally-rooted networks like Chattanooga's EPB not only offer nation-leading services but have tremendous community support." With this bill's passage, the Tennessee General Assembly will likely not pass any other broadband legislation during this session. The Broadband Accessibility Act won't improve Tennessee's rating as 29th in Internet connectivity, but it will do a great job of lining AT&T's pockets. As we've tracked throughout the session, there are a number of bills worth supporting that would actually increase connectivity and allow municipalities to take part in their own broadband future. While at the annual Iowa Association of Municipal Utilities Broadband Conference, I forced Ken Demlow to be our guest on Community Broadband Bits Podcast 247. Ken is the Sales Director for Newcom Technologies, where he has worked with many different fiber-optic deployments on the ground and is a fun guy to talk to more generally. Our discussion focuses on two main topics - the benefits of using fiber-optic connections to smart-grid applications rather than relying on wireless and the challenges that Google faced in getting on the poles in Nashville to build its fiber-optic network (which seems to be stalled). Ken had a front-row seat to the work in Nashville to get Google Fiber on poles but our conversation focuses on what is publicly known. We aren't breaking any insider secrets, but this is a very good discussion about the tremendous challenges of dealing with attachments on over 100,000 poles when contemplating a citywide metro fiber build. For people who haven't done it, this will explain why encouraging private sector competition at the physical network level is very difficult. And we keep it interesting - from possibly the worst idea for a sci-fi antagonist ever and how make-ready could fit into Greek myths. This show is 29 minutes long and can be played on this page or via iTunes or via the tool of your choice using this feed. Erwin Fiber is growing in stages and now that the utility in Erwin, Tennessee, has completed phase three of its Fiber-to-the-Home (FTTH) deployment, about half of its electricity customers have access to high-quality Internet access. That’s not all - phase four this spring will bring gigabit connectivity to more rural customers in two nearby mountain communities. All told, Erwin Fiber more than tripled its service area in 2016. A December grant from the Appalachian Regional Commission (ARC) will allow the utility to complete the spring build out, which will serve an additional 680 homes and 30 businesses. The Temple Hill and Bumpass Cove areas located in the mountains outside of downtown Erwin will have access to Erwin Fiber's symmetrical Internet access. Due to the remote character of these neighborhoods, people here had little prospect of obtaining high-quality Internet access from other providers. The 35-mile expansion will cost approximately $400,000. The municipality of about 6,000 people had considered the investment some 15 years prior but couldn’t afford the investment until recent years when the cost of deployment decreased. In January, Christopher interviewed Lee Brown and John Williams from Erwin Utilities who discussed the community’s project and explained how the fiber infrastructure is benefitting all the utility customers, even those who don’t subscribe to FTTH services. A new article from the Berkman Klein Center for Internet and Society takes a look at the pay in and pay off from Chattanooga’s investment into its fiber-optic network. The article, Smart Grid Paybacks: The Chattanooga Example, was written by Davd A. Talbot and Maria Paz-Canales. After building a fiber optic network throughout its service territory, the city-owned electric utility in Chattanooga, Tennessee, became the first U.S. company to offer Internet access speeds of 1 gigabit per second to customers. The fiber also serves as the backbone for a sophisticated smart grid. Data show that the savings produced by the smart grid, plus revenue from access fees paid by the utility’s Internet access business, more than cover the capital and operating costs of the smart grid. What’s more, we estimate this would still be true even if the utility hadn’t received a $111.6 million federal stimulus grant, and instead borrowed the extra amount. We reach this conclusion after counting direct savings in the utility’s operating costs (such as labor, truck maintenance, and fuel), avoided purchases of expensive wholesale power at peak times, and avoided power losses. The region is also experiencing second-order benefits including economic development and savings to local businesses thanks to fewer and shorter power outages. The data on the following two pages were provided by the utility (known as the Electric Power Board of Chattanooga, or EPB), and include data on second-order benefits originally published by Bento Lobo at the University of Tennessee at Chattanooga. The authors detail direct and indirect paybacks to the community from the smart grid investment. The grand total? $67.1 million. Morristown Utilities Commission (MUC) and Newport Utilities (NU) in Tennessee have taken the first monumental step in partnering to bring high-quality connectivity to NU customers. Both entities passed resolutions for an interlocal government agreement that will bring MUC’s FiberNET to Newport. The plan will allow MUC to expand its “light services,” which includes FiberNET, to NU’s service area in several phases. The first phase will allow more than 8,000 potential subscribers, or 47 percent of Cocke County households, to obtain FiberNET services. Phase One is scheduled to be completed in 2017; the partners also expect to begin Phase Two construction during the second quarter. Morristown and its gigabit network FiberNET have been on our radar for a long time. We’ve written about how this community, a relatively early adopter of the Fiber-to-the-Home (FTTH) network, has saved the community in several ways. By lowering electric costs with a smart meter program and by generally lower Internet access costs for government, businesses, and residents, FiberNET is saving Morristown in the tens of millions. The network is also attracting new jobs and contributing to city coffers through payment in lieu of taxes (PILOT). Listen to General Manager and CEO Jody Wigington talk to Christopher about Morristown’s decision to invest in Internet infrastructure. He visited us for episode 35 of the Community Broadband Bits podcast in 2013. This is the transcript for episode 242 of the Community Broadband Bits podcast. Our Christopher Mitchell invites Professor Susan Crawford to reflect on her recent travels through North Carolina and Tennessee. Both states have restricted communities from building new municipal networks. Listen to this episode here. Susan Crawford: It's much more about a very bipartisan, quite progressive group of people thinking about how to make life better in their communities, and that's terrific. That's truly American. Lisa Gonzalez: This is episode 242 of the Community Broadband Bits podcast from the Institute for Local Self-Reliance. I'm Lisa Gonzalez. We're pleased to have Susan Crawford back on the show this week. She's a Professor of Law at Harvard Law School, but she's also served as Special Assistant to President Obama for science, technology and innovation policy. Susan's CV is too long for us to go through point by point. She's authored several publications, including The Responsive City: Engaging Communities Through Data-Smart Governance, and The Telecom Industry and Monopoly power in the New Gilded Age. She's been on the show before to talk with Christopher about access to high-quality connectivity, and it's always a pleasure to have her back. As it turns out, Susan has been on a walkabout of sorts, visiting local communities as she works on her current book, and in this discussion she shares her impressions with Christopher. She's got some ideas on how she feels are the most effective ways to bring better connectivity to the most people, especially in rural areas, and she and Christopher hash through her findings. This article was co-written with ILSR's Energy Democracy initiative research associate, Karlee Weinmann, and is cross-posted on ILSR.org. Despite rising demand for energy efficiency and renewable electricity generation, large investor-owned utilities -- and many rural electric co-ops -- have resisted programs to address those needs. Likewise, corporate Internet service providers frequently offer shoddy service at high rates, a particular problem in rural areas with limited competition. But Ouachita Electric found a way to do both things better, with complementary technologies. Fiber-optic network investments provided lower cost Internet access, but also provide an information backbone for the electric utility that can reduce outage times and verification for energy savings programs. The network and the efficiency programs reduce costs for a customer base dominated by low-income households that can now reinvest their earnings elsewhere in the community. The utility’s tariff-based, on-bill financing program -- known as HELP PAYS -- allows customers to invest in energy efficiency upgrades at their homes, like insulation and heat pumps, with no upfront cost. 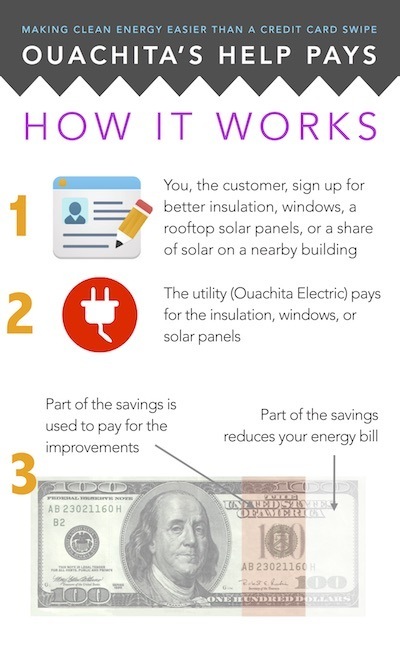 Ouachita Electric covers eligible expenses, then recoups its buy-in through payments from participating customers on their monthly bills. Customers immediately pay less thanks to utility-financed energy-saving improvements. Low-income households can pay, because they don’t need to come up with thousands of dollars upfront for qualifying improvements. Susan Crawford has come back to the podcast to tell us about her recent travels in North Carolina and Tennessee, talking to people on the ground that have already built fiber-optic networks or are in the midst of figuring out how to get them deployed. Susan is a professor at Harvard Law, the author of The Responsive City: Engaging Communities Through Data-Smart Governance and Captive Audience: The Telecom Industry and Monopoly Power in the New Gilded Age, and a champion for universal high quality Internet access. We have an informal discussion that ranges from what is happening on the ground in North Carolina and Tennessee to the role of federal policy to why Susan feels that municipal wholesale approaches are important to ensuring we have better Internet access. It was a real treat to have Susan back on the show and to just have a discussion about many of the issues that don't always come up in more formal presentations or media interviews. We hope you enjoy it! Susan was previously on episode 125 and episode 29. This show is 21 minutes long and can be played on this page or via iTunes or via the tool of your choice using this feed.